Legislative District 11, which straddles Pima and Pinal counties, has enough Republican voters it might look like an easy win for Republicans who have held it since 2013. But don't try to tell that to Hollace Lyon, a Democrat making her second run for a house seat in the district. Lyon started campaigning and fundraising last September and has amassed a war chest of $150,000 and counting, larger than the two Republican candidates put together. The campaign funds combined with her targeted, persistent ground game—volunteers have knocked on 13,000 doors—put her solidly in the running, especially in an election season which continues to be full of surprises. I sat down with Hollace Lyon over coffee where we discussed the campaign and her stance on the issues. Full disclosure: I've known Hollace for years and would love to see her pull out a win in LD-11. This post is certainly an endorsement. It's also a way to let readers know who she is. Hollace Lyon is a moderate Democrat who has a detailed platform on her website laying out her stands on the major issues facing the state. However, she says her main focus is fiscal responsibility. 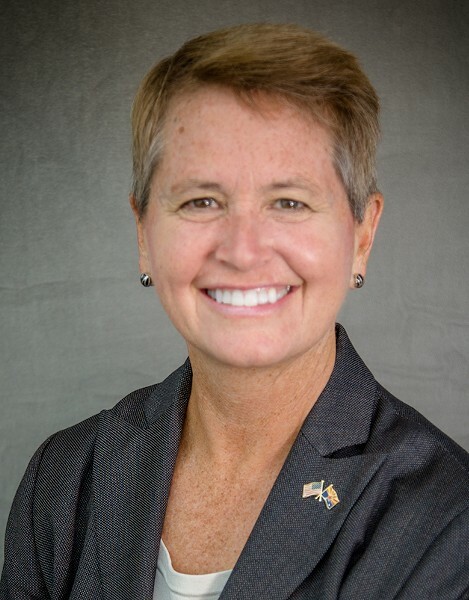 She developed skills with budgets and negotiation during her 26-year career in the Air Force, and she wants to bring those skills to the legislature. Lyon says her Air Force experience taught her she's a moderate. "One of the more important aspects I took out of the Air Force was, I learned I don't always have the answers I think I have," she said. "When I think I'm right about things, I've learned I'd better stop, get some input, weigh things and see the consequences of certain decisions before I press forward." Lyon puts her Air Force service front and center in her campaign. "When I knock on doors," she told me, "I say to people, 'I'm a retired Air Force colonel with 26 years experience. I commanded two squadrons. I did strategic planning. I ran the NATO satellite system during the Bosnian War. I negotiated with Microsoft to save the Air Force $200 million. I negotiated fielding the NATO nuclear planning system between Turkey and Greece.'" Lyon continued, "I want to use my skills in budgeting and negotiation to figure out where the money we've been paying into the state has gone, money that we thought was going to fund schools and fix roads." Voters have seen their taxes go up, most often at the local level "because the state has stopped paying for things they're supposed to pay for." The reason state funds have been insufficient? "You've heard this before, it's the cumulative tax giveaways. And every year, the Legislature and the governor add more." Some tax incentives are good for the state, Lyon says. "I believe in tax incentives, but we need to find out which items are giving us a return on investment and keep those, then get rid of the ones where we're just giving money away." She wants to see a bipartisan group of people work together with the state auditor to look at the current tax loopholes and report back to the legislature. Then, we need a Legislature receptive to getting rid of tax giveaways which don't benefit the state. More money in the state budget would help fund our system of public education, another important issue for Lyon. She is a big supporter of the #RedforEd movement. "I was so happy to see teachers get so motivated. We've seen the funding train wreck coming for a long time. Now, teachers are talking to each other, sharing information. It doesn't matter if they're Republican or Democrat, they care about schools." Lyon wants to see teachers receive competitive wages and benefits. She also advocates for restoring capital funding so our buildings, buses and technology can be repaired and updated, and for bringing back full-day kindergarten. When it comes to vouchers, Lyon doesn't want to see them cut entirely. "What they were originally for, giving parents a choice to get special types of help for their children, that was a good reason for vouchers." But vouchers have expanded to include too many students. "That money should go back into the general fund, then to public schools like it's supposed to." Lyon is a strong advocate for improving the state's overall infrastructure, which includes roads, water, clean energy and access to high-speed internet. "The internet is part of our infrastructure now, and that needs to reach out into our rural areas." LD-11 is about 2,000 square miles. It takes Lyon two hours to drive from one end to the other. She and Ralph Atchue, who is running for state Senate, have merged their supporters so they can cover the district with what Lyon calls "rolling canvasses." "I've been active in politics for years," Lyon said, "and I've got a base of supporters in my area, around Saddlebrooke. Ralph Atchue lives in Eloy. He helped build up a Casa Grande Democratic Club and has reached out to clubs in the town of Maricopa. We've divided the district into zones. We use the same volunteers to walk the district for both of us."